participants who vow to read daily. platform. Please visit our MEDIA CENTER to experience her transformation. At Flying Geese Productions, we primarily target students in grades K – 12. Making such an indelible impression upon the minds of leaders gives us many hopes and aspirations for such a brighter future tomorrows future. Hey Everyone!! Just got word that this 4-character show will be opening in North Hollywood at the Secret Rose Theater on Magnolia on Friday, May 16 – 25, 2014- eight shows only!!! I have seen this professional touring actress in action and you won’t want to miss this show!!!! Four different characters on one stage…A MUST SEE!!!! Please see us at GoFundMe.com to contribute to the next generations!!! We are committed to help all to learn to READ!!! We are taking names of those who would like to volunteer for one hour to help someone to READ better. The next generation needs you so very much. Please contact us and let us know how to reach you for this important work anyone can do!!! Thank you in advance and please donate any amount!!! Just saw you at the African American library in Houston and loved every second of it with my children. Your website stated you are not taking bookings but will you share the expenses so I can take it back to my school. Thank you!!! Your performances are always great Melissa. Students and adults of all ages will truly benefit from your performance. I have attended at least 25 of your performances and each time I have learned something new. 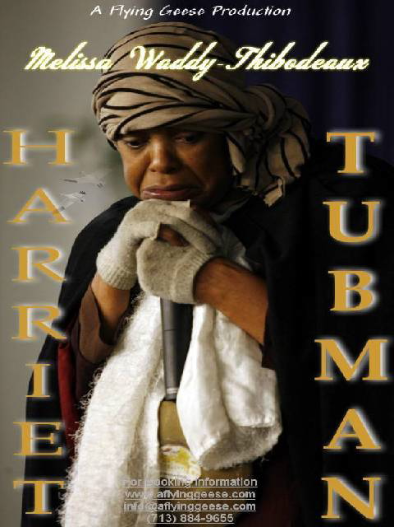 Thank you for your excellent performance of Harriet Tubman. My little girl was inspired by you. She told me that you were so good that she thought you were the real Harriet Tubman. You inspired her to read and to help others learn how to read. She got your messages! She says that she can’t wait for you to teach her how to act. Such a short time but a HUGE impression you made on my 7 year old. Thank you and God bless you. We will definitely be looking to have you work with her over the summer! I would love to give your child acting lessons! I’m currently booking shows NOW through 2019 school year! We are booking schools, museums, libraries, special family events, churches, etc. Please contact me at 713-884-9655 or email me at waddymel@yahoo.com Thank You! M.Waddy-Thibodeaux as Harriet Tubman joined by Former NAACP president, Kwesi Mfume. M. Waddy-Thibodeaux as Harriet Tubman marches in 2002 Juneteenth Celebration in Missouri.